Allegorical tales, when well-told, can be chilling and effective. Otherwise, the connection is lost and the message is too confounded to discern for the young reader. Eve Bunting is a master at this sort of iron-hand-in-velvet glove approach to allegory (as in Terrible Things). And it works well in this story about the enticement of power for a young kid looking for a place to fit in. Danny is a new kid in town, all of 10 years, raring to go. A glittery-eyed tiger comes along and offers him a free ride. Danny hops on. As the tiger walks, Danny feels a sense of veneration and awe from the bystanders. And, when the tiger struts around getting brusque and acting tough, Danny feels a surge of elation at first. He willingly goes along because he feels respected, as if he is getting noticed for the first time. That sort of attention can get addictive. Plus he is a bit scared of the tiger himself, as the tiger is gradually revealing its true stripes. The tiger claims to have power, but, it clearly abuses its might. It intimidates and controls others without any provocation or cause. As they prowl on, Danny notices the fear and helplessness the tiger invokes in others. Danny begins to feel a justified discomfort at this point. "Do you want what I want?" asks the tiger, "Because anyone who isn't for us is against us." In the end, when Danny tries to get down from his ride in order to help an old man who was hurt as a result of tiger's intimidation, the tiger says, "Stay where you are." This is the moral dilemma, a crisis of conscience for Danny. He sees no reason why he should not help the poor old man who is hurt and is whimpering faintly. I hung halfway on and halfway off the tiger, and I knew I had an option. Which was the same as a choice. I glanced down. The ground was so far below me. Once you get up on the tiger's back, it's hard to get off. Danny stands up for what is right and hops off the tiger, refusing to ride with it anymore. "You've had your chance. You'll never be one of us. You are all alone now, kid," said the tiger. If only it were that easy to dissociate oneself from the giddying thrill of dominance and live to lead one's life free from power struggles, the world would be a better place. Some don't want to get off the tiger's back; and even those that do want to get off, can't let go of the only connection they have to a community, to feel like they belong somewhere, like the only place to be is on this tiger's back with due recognition, rather than on the ground, ignored and forgotten. The story can be applied to inner city gangs, to bullies in street-corners and school halls, even to adults who abuse their powerful position of authority. The woodcut illustrations add to the menace of the tiger while the reds, oranges and blacks make it all seem ominous. Horrifying as it was, the book was a wonderful read for the resident nine year old who got the underlying idea after a couple of reads. 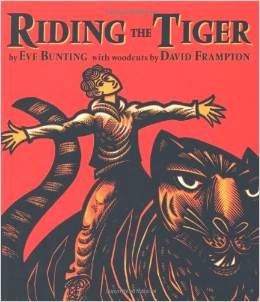 While Your Move by Eve Bunting, illustrated by James E. Ransome, deals with the gang menace head on, Riding the Tiger covers a broader idea of doing what one feels is right without being bullied into making the wrong choice for the sake of misplaced loyalty or conformity. Of course, children's books have to end with the possibility of breaking free and leading one's life by making the right choice. Otherwise, where is the incentive in reading it, discussing it, using it to illustrate the truly complex dynamics of survival in a tough world.